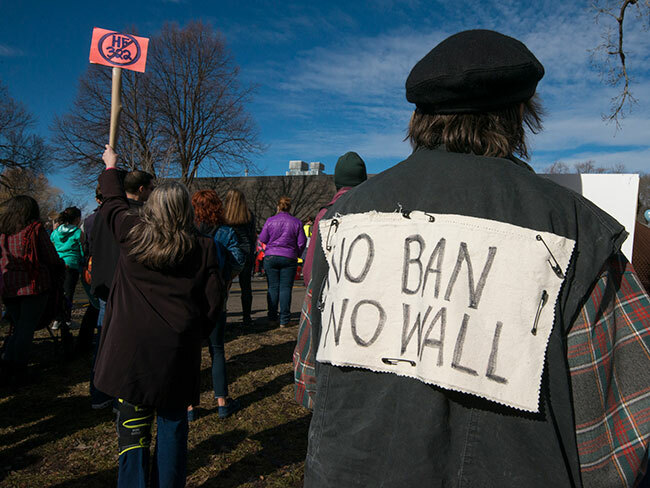 About 3000 people gathered in Powderhorn Park to stand in solidarity with immigrants and refugees. Photo Credit: Flickr User Fibonacci Blue 2017-02-18 Licensed under the Creative Commons Attribution License. It is a place where things meet, a frontier, a point of contact, a point of crossing, what we might best think of as a contact zone. It is a means of closing off contact whether for reasons of defense, offense, or paranoia. The very first cities in the world, like the mythic city of Uruk we meet in The Epic of Gilgamesh, were surrounded by massive walls. 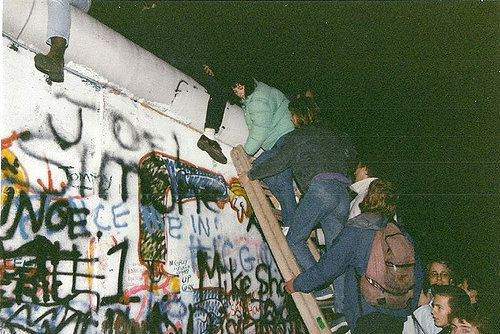 The Berlin Wall was a wall designed to keep people in. The wall Israel has erected in the West Bank is designed to keep people out, the very people upon whose land it is built. The wall President Trump proposes is also a wall intended to keep people out, and it is as suspect as these other walls from a moral point of view. The walled border between North and South Korea is one part offense, one part defense, two parts paranoia and it is lived as such on both sides. That’s one of the uncanny things about the space walls create–namely, deep divisions. 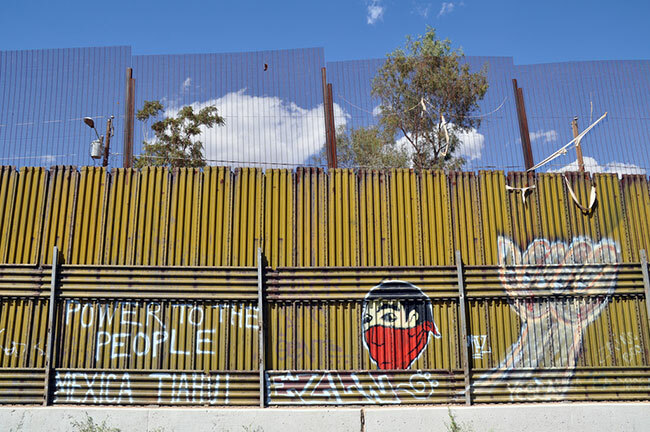 But even for that wall to work, the professionals on both sides must talk, every hour and every day, to manage their crossings with care. Some one million persons cross the US-Mexican border, legally and in controlled fashion, every day. Most of them transit across this border to go to work, then they return home. Palestinian workers similarly transit across the Israeli wall, when permitted to do so. 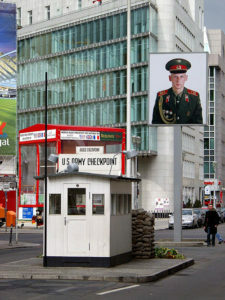 “Checkpoint Charlie” ensured the same relatively smooth transit across the Berlin Wall, for many years. There is a lot more to walls than closing borders and breaking contact. And I sit here, now, and I am hopeless. because I had so many things to do, on the outside. When they were building the walls (teichê), how did I not notice? Yet I never heard the builders, not one sound. One brick at a time, they have closed me off from the world outside. Cavafy plays on the way two words–one for walls (teichê) and one for fate (tuchê)–sound nearly identical in Modern Greek, because that is the way the wall-builders justify themselves; they claim the wall as a fateful necessity. For many at the end of the nineteenth century, the walls that define the borders separating religions, or races, or nations, from one another were believed to be very thick and very high and very necessary. Yet this idea of walled enclaves threatens to erase the proud story of the Balkans in particular, where a multi-ethnic, multi-religious and polyglot culture existed for centuries. People freely intermarried. They breast-fed one another’s children, raised them to speak more than one language, to participate in more than one religion, to see themselves as part of more than one ethnic arrangement. There were no walls of separation; there were simply borders of various kinds to be crossed and re-crossed as necessary. But now, Cavafy suggests, the “walls” (teichê) have been equated with what is “fateful necessity” (tuchê): the necessity of closing the borders. Not to put too fine a point on it, but what Cavafy’s poem saw coming were the violent wars of nationalism that pretty much defined the 20th century and its unique horrors, culminating in the genocidal desire actually “to make a people disappear.” Two Balkan Wars of terrible ferocity were fought in 1912 and 1913, they pitted Greeks and Bulgarians and Serbians and Albanians and Turks against one another. These wars were followed by the bloodbath of the First World War of 1914-1918. Somehow, the “liberals” like Woodrow Wilson (the extent of whose racism we now know much better than anyone did at the time) convinced themselves that the best solution for such ethno-religious and nationalist conflict was the principle of “one people, one nation.” Never mind that no one explained how they intended to define “a people,” or who would grant such people recognition, or citizenship (or a passport). This was the first significant step taken toward the “blood-and-soil” nationalism of the 1930s, which erupted into the Second World War of 1939-1945, and again in the former Yugoslavia in 1991. Borders are very loose and very fragile things which must be tended with great care. There is nothing careful about a wall. Since the Ottoman Empire joined in an alliance with Germany and the Habsburgs, it was carved up after the First World War–into “nations” comprised (allegedly) of separate “peoples.” The borders separating most of these nations were surprisingly fluid and difficult to wall-off. In parts of the Aegean Sea where “Greeks” and “Turks” had lived side-by-side for centuries, the decision was made to force massive population exchanges in 1922-1923. Greeks who had lived for five hundred years or more on the coast of Asia Minor and in Istanbul were forced to leave. Turks who had lived just as long in Crete, the Peloponnese, Epirus and elsewhere were similarly uprooted. These people did not want to leave; the wall police forced them to do so. There are poignant pictures circulating now from that period of the so-called Asia Minor catastrophe. The beaches on the island of Lesbos were covered with tent-cities in which Asia Minor refugees awaited resettlement in Greece. Precisely these same beaches host tent-cities of Syrian refugees today. But the border separating Greece from Turkey is an ocean; there is no way to build a wall. Normally, some 70,000 people crossed that sea-lane in any given year. In 2015, 1.2 million souls crossed over; they were not going to work. In the second half of 2016, the number slowed to 20,000, but there were already 65,000 people stuck in transit, and housed in temporary refugee settlements in the country–all this, in a country of only 10 million citizens literally overwhelmed by this flood of desperate humanity. The nation of Greece, locked for the past nine years in a brutal and brutalizing economic austerity regime imposed upon it by the largest European banking interests, does not have the economic means to process people in such numbers, nor any way to arrange for their transit away from the relevant island-or-land-based points of entry. Despite all of this, Greece has not tried to close its border, and it has never proposed building a wall. The walls and fences went up elsewhere, to the north, deeper inside the European Union. Greece has also, tellingly, never asked who is paying for the support of this stream of desperate refugees. We all pay for such things, of course, whether we wish to see it or not. We also all pay for the unintended consequences when walls in fact are built with insufficient care. Cavafy was born and lived most of his life in Egypt. He lived for a time in England and Istanbul; he never lived in the modern nation-state of Greece, yet Greeks love him just the same. It is something to do with the Greek language, and something to do with the Hellenic philosophy, and something to do with the Mediterranean Sea. You can’t wall off the sea; blocking sea passage would wreak as much human havoc as these various land walls have done. The United States is a very large country with vast borders of various kinds. Indeed, one thing Greece and the USA share is the curious and ambivalent history of two nations whose borders have changed, mostly through military conquest, repeatedly from the mid-nineteenth century until the end of the Second World War. Walls make little sense where borders are so fluid. Today, the US shares an enormous land border with its Mexican neighbors to the south and its Canadian neighbors to the north. We also possess two ocean borders along the Atlantic and Pacific coasts–not to mention further island holdings, in both oceans, and a massive frontier to the northwest in Alaska. All of these are borders; all of these are points of crossing. Tens of millions of persons of all nationalities, ethnic and religious affiliations, language groups and other identities traverse these borders, legally and in controlled fashion, every year. They come to study in our world-class universities, they come to revel in our unprecedented system of national parks and preserves, they come to savor the distinctiveness of our pluralistic culture and regionalism, and of course they come to work as well. Geographically speaking, this country is very much like Greece, open by sea (and now by air) to anyone and anywhere. 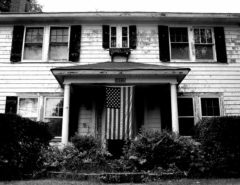 Culturally however, this country seems very unlike Greece, lacking in the very charity and hospitality so famously celebrated by our Statue of Liberty. Anyone seriously concerned with the security of the passage across our many different borders would put his or her mind to those un-wall-able sea-lanes, not just the southwestern desert. If you do not think clearly about what is a border, and what is a wall, you cannot make good sense, or sound policy, of either. Borders are points of crossing, crossing that wants management and professionalism and funding and care, to be sure. But borders are not sources of human crisis. . . until one tries to build a wall.